The odd way I start looking at events like this leads me to start asking myself the question, "When is the right time to quit?" Countless projects, relationships, activities and agreements in your life fall on either side of that question. There are times that it is the right thing to quit, to stick with something would be an exercise in futility. Many times we can look back and wish we would have quit earlier. 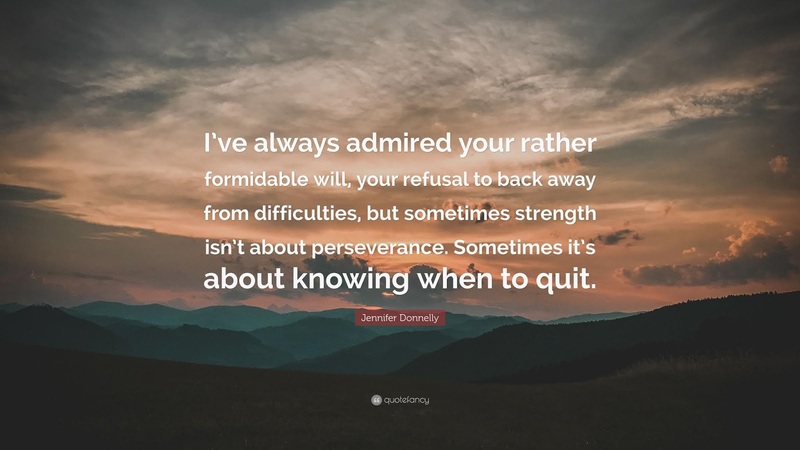 Other times we will be in a situation where you think you want to quit but if you persevere the rewards are within your grasp. Many times we can look back and realize we quit something before we should have. When is the right time to quit? The challenge is we often don't know until we look back on it with the advantage of hindsight. I think the key is not about if it is right to quit or it is right to persevere. The key is about not regretting your decision when you reflect on it. In our lives we are going to quit things later than we should and earlier than we should. We are going to quit things we shouldn't have given up on and we are going to persist in the things we need to let go of. If you are happy with your decision isn't that all that matters? For Vontae Davis, I have to believe he knew what it was going to look like to his teammates and the public. If that is the decision he came to that he felt was right for him, despite all of the forces against it, then I wish him the best of luck. At the end of the day, we have to each take care of ourselves first, we are no good to others if we aren't true to ourselves.